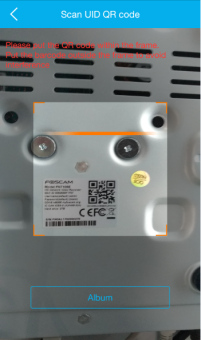 How to add NVR to Foscam NVR app? There are 3 methods to add a NVR to Foscam NVR app, search IP in LAN, scan QR code and use IP/DDNS manually. Below are the steps. Open the Foscam NVR app, tap on “+ “ button to add new device. If you already registered account on myfoscam.com or Foscam app, you can use this account to login Foscam NVR app directly. Or else you need register first before you can login the app. Choose a method and continue to add device. Search on LAN: It will search NVR connected to same router as mobile phone. Please make sure your NVR is already connected to same router as mobile phone, so the device can be found. Scan QR code: For NVR that has QR code you can use app to scan it’s QR code to add. You can find NVR QR code on it’s bottom sticker. Manual UID/DDNS/IP: Manually input UID,DDNS or IP of the NVR you can also add it to app. When you use DDNS or External IP to add NVR, please ensure you have setup remote access successfully. Please input correct username and password of the NVR. Then wait for NVR to be added to Foscam NVR app, once done you can see it in main page. And tap on play icon you’ll be able to view its live video.